WTI crude prices are in the $43.00/b-$43.50/b range this morning. 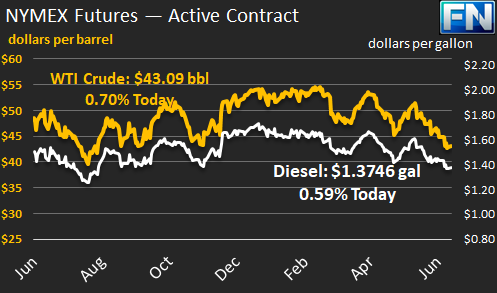 Prices strengthened modestly on Friday, closing at $43.01/b, which was a gain of $0.21 for the day. The week as a whole nonetheless ended in the red, down by $1.67 between Monday’s opening and Friday’s close. WTI opened at $43.16/b today, up by $0.36, or 0.84%, above Friday’s opening price. WTI is currently $43.09/b, up by $0.08 from Friday’s closing price. Diesel opened at $1.3765/gallon this morning. This was an increase of 0.44 cents (0.32%) above Friday’s opening price. Diesel prices ended last week down by 5.15 cents per gallon. Current prices are $1.3746/gallon, up by 0.29 cents from Friday’s closing price. Gasoline opened at $1.4352/gallon today. This was a small decline of 0.17 cents, or 0.12%, from Friday’s opening. Prices are $1.4364/gallon currently, up by 0.23 cents since Friday’s close. 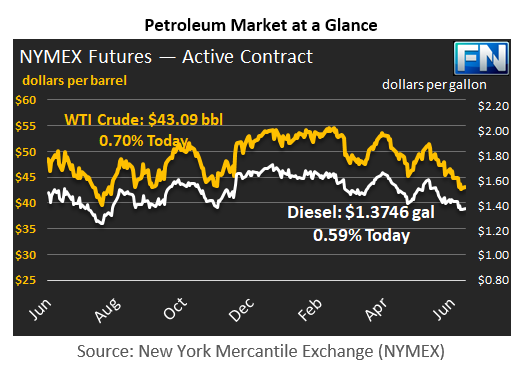 Crude and product prices have posted losses for the last four weeks, with oversupply and hefty stockpiles continuing to weigh on the market. Last week, WTI crude prices threatened to fall through the $42/b floor, bringing the lowest prices since August 2016. Prices have crept up gradually since then, and they are managing to remain above $43/b. WTI prices managed to regain the $43/b level even after Baker Hughes released its active rig count data on Friday. Eight additional rigs were added to the count, bringing the total to 941. This was the highest rig count in 26 months. The U.S. Dollar Index opened lower this morning, with bullish investors retreating. Dollar weakness may be helping support oil prices. Fed Chair Janet Yellen is scheduled to make an address tomorrow, and four other Fed members are scheduled to make speeches during the week. The European Central Bank will be holding its annual forum in Portugal also. It will be a busy week for U.S. and European currencies.